Pammy Blogs Beauty: Casual Chic for the New Year with JustFab: My January JustFab Selections! Casual Chic for the New Year with JustFab: My January JustFab Selections! It is time for a wardrobe update with JustFab! Winter can be such a blah time of year. I must say, the upside to the cold weather certainly is the opportunity to wear cute boots! lol! Seriously, it was so warm here in GA all the way through Christmas. So, now that it is finally cold enough for boots, I am all about it! This month, I picked out some super cute everyday boots, a versatile and flowy black top, and a stand-out red handbag. I am so excited to tell you about each of these as I totally love them! But...before I do, have you heard of JustFab? JustFab has long been my go-to site for affordable and trendy shoes, handbags, and accessories. If you haven't been on JustFab.com lately, they also have a full line of clothing now, too. Yes, that is right, you can now shop from head-to-toe from JustFab for complete looks! JustFab's clothing, shoes, handbags and accessories are current and on-trend. You can browse items individually on the site or shop the looks to get everything you need to complete your outfit. Personally, I have always loved shopping outfits! It is just so easy that way to make sure that you have everything you need and don't end up with individual items that don't go with anything you have already. Shoes and Handbags start at $39.95 and clothing starts at $9.95. When you join as a VIP you get the option to purchase items monthly from a personal boutique created with your style in mind, or can skip the month if you don't feel like spending. What a fun way to shop! Ok, now that I have explained how JustFab works, lets get right to my wardrobe update! Click "read more" below to find out more details about my new boots, handbag, and top from JustFab! I just love my items that I got from JustFab this month! I got the Hanky Hem Shirt in Black (my first time ordering a top from JustFab! ), the gorgeous Simon handbag in Red, and the Montie bootie in black. I really like all of the items...but, this month the stand-out must-have item is the Simon handbag! JustFab handbags really fit my lifestyle. For many years I only carried designer bags. Then I started having babies and only carried diaper bags for a few years. Well, now my babies are getting older (sniff sniff! They are 2 and 4 now) and I am gradually transitioning away from diaper bags. I really only carry a true diaper bag now if I am away from home for the whole day. 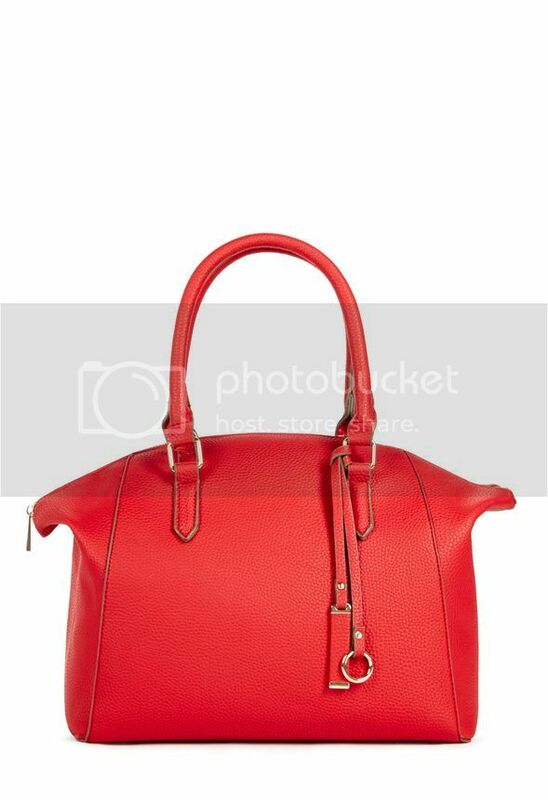 Otherwise, I would much rather opt for an inexpensive large handbag from JustFab! This Simon handbag is beautiful! I love the vibrant red color in the midst of this very cold January. I tend to wear a lot of black and gray this time of year. So, I really appreciate a vibrant pop of color! The bag is large, but not too crazy-big. The handles are just long enough to be able to slip this bag on my shoulder but not too long to carry with my hands (shoulder drop is 7"). I love the pretty details, too (like the tie on accent on the handle with the gold detailing). The interior has one cell phone pocket and one zip pocket. I can fit everything I need for myself plus snacks, diapers, wipes, and sippys for the kids! Perfect!!! Nothing beats a pair of cool black booties that you can wear every day. These are those booties! The boots are super comfortable. They have a two-tone lug sole and are fully lined with faux shearling. So, they are warm, too! The buckles and straps give them just a little bit of edge; which, I like! These boots are perfect for wearing with leggings or jeans. These are a must-have for everyday. They are so easy to wear! I really like the quality of these, too. They do not look like they are inexpensive! I have been on the quest for a perfect black top to wear with leggings and skinny jeans...and this is it! I can't get over how hard it is sometimes to find something basic...like a black shirt. So, I am super happy that I ordered this from JustFab! The fit is loose and big without looking "too big" (I have a slender frame. So, sometimes these types of tops just fit too big. However, this one is just right). The black beaded strap detail at the top of the shirt is really beautiful! Honestly, this is a top that looks better in person than online! It hangs down just low enough to cover your bottom if you are wearing leggings. The fabric is lightweight. I adore this top and want to get more colors! I just love the items that I got from JustFab this month! They all have already become staple items in my fashion and wardrobe rotation! Have you done any wardrobe updates this month? I would love to hear about your recent purchases! The Montie Bootie is super cute!